Vibrations on the hand grip of a power saw can cause serious consequences to the human body (arms, wrists and fingers). The natural vibration of the hand grip as well as the excitation mechanism, play a central roll. 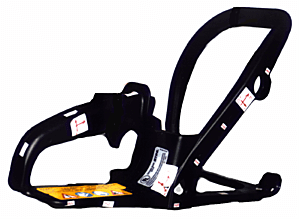 Using the example of the investigated power saw, the hand grip is connected to the motor housing via a rubber suspension. The chain runs over the tongue, which is screwed onto the motor housing. Vibrations due to dynamic motor and chain forces, which are somewhat reduced by the hand grip, have an influence on the operator. The center figure illustrates the mode shape of the power saw at 74 [Hz]. 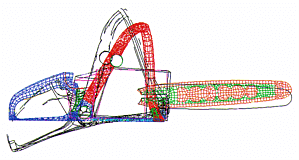 The motor and tongue tilt on the vertical and horizontal axis causing the hand grip to tilt against it and deform. In the speed range around 9000 [min-1], motor and chain forces excite this mode shape leading to increased accelerations on the hand grip. Such resonant conditioned increases can also be observed at 56 [Hz], 62 [Hz], 68 [Hz] and 84 [Hz]. 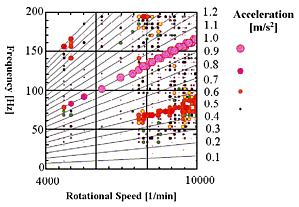 The lowest order of excitation of the employed two-stroke engine (EO=1) is clearly illustrated on the acceleration signal of the hand grip (bottom figure), during the operating vibration analysis. In addition, subharmonic orders are excited in the critical frequency range (0 to 100 [Hz]). The order of excitation EO=1/2 abruptly occurs above 7500 [min-1]. The increasing excitation intensities, which are caused by speed, lead to a typical frequency splitting at 9400 [min-1] with resonances at 62 [Hz] and at 84 [Hz]. A mathematical model, formulated with the chaos theory, describes this phenomenon. By varying the model parameters, constructive measures have been developed to avoid the vibrations. A reduction of 60% in magnitude, for vibrations affecting the operator could be achieved.